I was recently compelled to get rid of a wasp nest that was dangerously close to our outside seating area. Of course I could not resist taking a closer look. It was a small nest, only a couple of dozen cells in various stages of development. 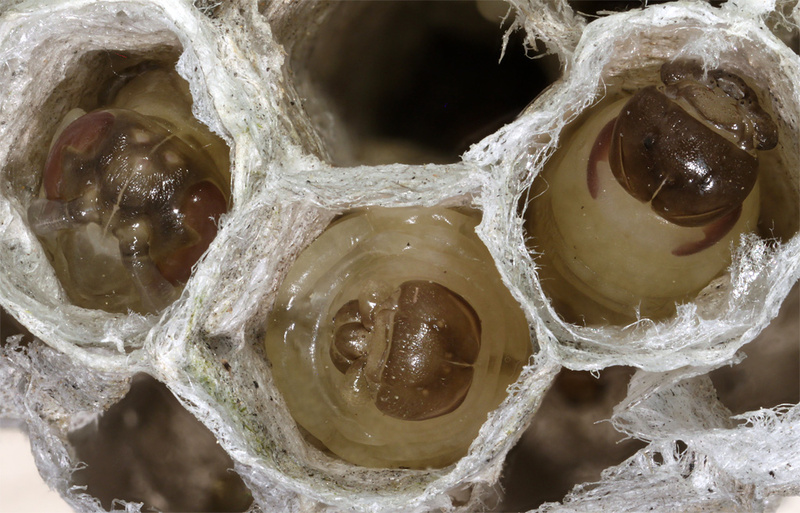 Two of the cells were capped with silk, indicating that their occupants were in the process of pupating. In the center is a cell that was not capped. It contains a nearly mature larva. The other two cells are the ones that were capped. They contained one fully developed pupa (on the left) and one pre-pupa (on the right). 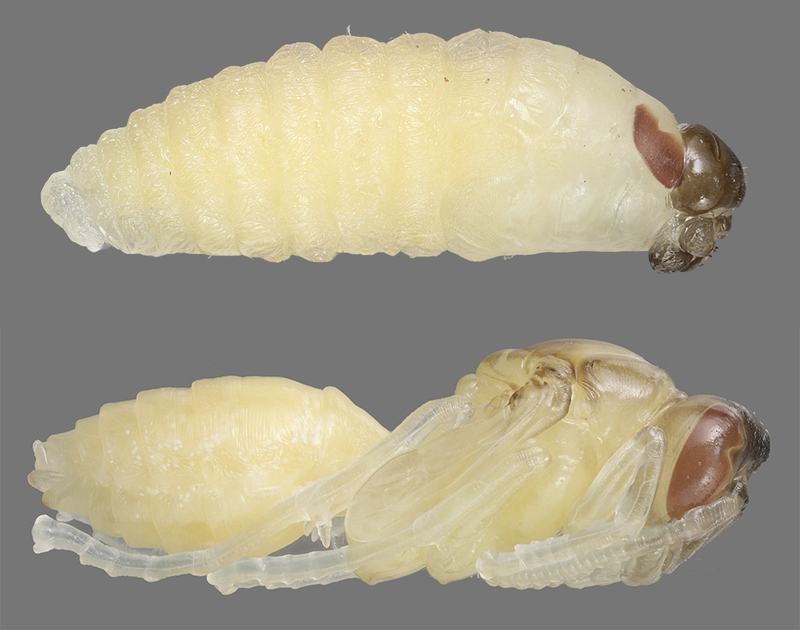 By "pre-pupa", I mean a larva that had stopped eating some time ago and has done a lot of internal restructuring but has not yet molted into a full pupa. I think it's interesting to see how much of the adult gross morphology is present in the pupa immediately after the pre-pupa molts. The usual story of complete metamorphosis is that "during the pupal stage" there is massive restructuring of all the body tissues, essentially growing an adult body from the dissolving tissues of the larva. In the grand scheme of things that's a pretty good description, but it doesn't really capture how much of that restructuring actually happens before the final molt to pupa, inside the last larval skin. The pupa that you see here -- with legs, wings, and antennae fully represented in the body form -- is very close to exactly what squirms out of the last larval skin when it finally molts. There is probably some elongation of limbs, not possible within the skin, but all the parts are there by the time the molt occurs. Even in the pre-pupa, the pupal eyes are clearly visible through the skin. This is easiest to see in the first picture, comparing the center and right forms. Just to give you an idea how much further restructuring happens during the latter part of pupation, here's a closer view of those hind feet, still inside their pupal shell. When the pupa was young, there was essentially no visible structure inside these things except for a tracheal tube. This is just a 2-frame stack, and manual at that, using a mask in Photoshop. I would love to do a deep high resolution stack of this thing in stereo, but it's wiggling around continuously right now. To get even this much, I had to shoot a number of frames essentially at random, then picked two where one foot was in the same position but differently focused so I could use some detail from both frames. This latest one was with Mitutoyo 5X, Raynox DCR-150, and an auxiliary iris stopped down to get more depth of field. The earlier stacks were at 1:1 using either Canon MP-E 65 or Canon 100 mm macro. All are shot in a vertical setup, with the subject sitting on a haze filter about 2 inches above paper background. Backgrounds were cleaned up in Photoshop in the first post. Jansjö LED illumination for the first post, electronic flash for the second, paper diffusers in all cases. Thanks Rik for posting these images and the discussion. A lot more impressive than I have seen in textbooks! A riddle of sorts: "When is a pupa not a pupa?" , when it is a pharate adult. Thanks, guys. I'm glad you found these interesting. NikonUser, thanks for the new word! A couple of them, really, since googling on "pharate" shipped me off to https://en.wikipedia.org/wiki/Pupa which also taught me "exarate" -- very relevant in this case. The adult emerged a couple of days ago. I did not shoot any more pictures of the development, but in direct observation under a dissecting scope, I was intrigued to see that near the end there was no spare fluid visible. Instead, the very thin skin of the pupa was snugged in tight against the pharate adult inside, even against the tarsal segments and claws. I suppose that the adult must absorb the fluid. It seems like there would be a huge opportunity cost for letting fluid escape, especially in the near-desert climate here. Thank you Rik! very informative! Rik, Very well done and as has been said, very informative.